Meet the ‘smallest baby’ who only weighed as much as a bar of chocolate when she was born . Little Manushi tipped the scales at just 14oz – the same weight as a bar of Cadbury’s chocolate – when she was born 12 weeks early. The tiny tot measured just 8.6in long and is thought to be the smallest surviving baby ever born in Asia. She was born early by emergency c-section when her mum’s blood pressure rocketed and the baby was in danger. Her minuscule feet were no bigger than her dad’s thumbnail. But Manushi was born not breathing, with underdeveloped lungs, heart, brain and kidneys and paper-thin skin. Now, six months on, she is finally well enough to be discharged from hospital and went home on Thursday, weighing just 5.2lbs. Delighted mum Seeta, 48, and dad Giriraj, 50, from Rajasthan, India, said she was their real-life miracle. Mum Seeta suffered dangerously high blood pressure during her pregnancy and an ultrasound revealed an absence of blood flow to the foetus. She underwent a c-section on June 15, at 28 weeks, and Manushi was put on a ventilator and transferred to Jivanta Children’s Hospital NICU. The tiny baby was given a 0.5% chance of survival without brain damage, and there was no reported survival of a baby weighing this small in India and South Asia. Dr Sunil Janged, chief neo-natologist said: “When the baby was born, we were uncertain of what could happen. “She was struggling to breathe, so was immediately put on advanced respiratory support ventilator to expand her tiny, immature lungs. “She could not be fed adequately due to immaturity of her gut. In her first few days Manushi actually she lost weight, but after seven weeks was able to start taking milk. Manushi’s minute feet were so tiny when she was first born. She had blood transfusions and respiratory support. But after 210 days in NICU she has been discharged and doctors said her brain is structurally normal and her eyes are developing as they should. Normally, Manushi’s medical treatment would have cost 1,000,000 rupees – around £11,500 – but the hospital charged a nominal fee, due to her family’s low income. Hospital director Dr Sunil Janged said: “We decided to save the life of the baby and offer her necessary medical care and attention because we wanted to send out a message that a girl child must be protected. Dr Ajay Gambhir, former president of National Neonatology Forum of India added: “We are grateful to Seeta and her family. “We appreciate them for setting a new example to the community. “In Rajasthan the girls [like this] are still considered a burden, and are thrown in the trash immediately after birth or are left in the orphanage. 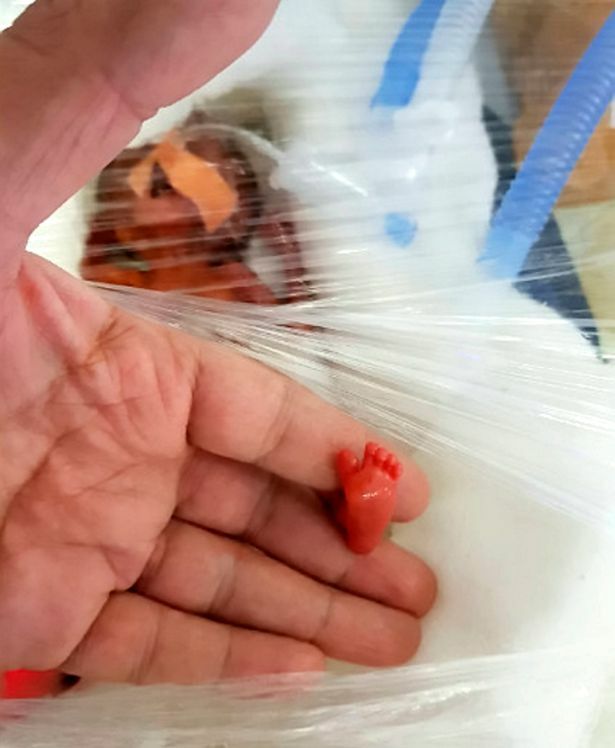 The smallest baby ever born is thought to be Emilia Grabarczyk, who was born weighing 229g – 8oz – in Witten, Germany, in 2015. Ooooh what a sweet little baby! So precious!